The iconic girl detective is back with her sleuthing and feminism intact, along with a tomboy bestie who's proudly gay. Publisher Edward Stratemeyer created the self-made, plucky Nancy in the 1930s, churning out dozens of Nancy Drew Mysteries from various writers over the decades who wrote under the pen name Carolyn Keene. While she endured several permutations through the years based on the politics and social mores of the era, the titular character was always something of a feminist considering her fearlessness and agency in the face of danger, not to mention her enduring devotion to her female friends. 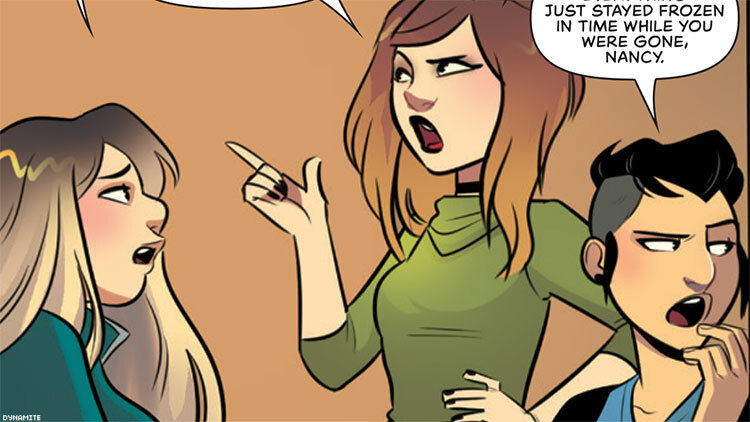 But the New Nancy Drew Mystery Stories (due out in June) that Dynamite put together under packager and editor Nathan Cosby, and written by Kelly Thompson and illustrated by Jenn St-Onge, takes the series in an unmistakably empowered, intersectional, and queer direction. Fans of the original who never quite looked or felt like the scrubbed upper-middle-class straight white teens depicted in those books will finally have an array of characters who better represent them. While Thompson says she’s read several of the original Nancy Drew books but admits she’s not what one might call a super fan, illustrator St-Onge (IDW’s The Misfits, Bingo Love) arrived at the new comic having immersed herself in Nancy’s world as an adolescent. Together, Thompson and St-Onge, who worked together on Dynamite’s Jem series, plunge the reader into the new series with the first panels depicting a high-stakes action sequence brimming with humor. The ever-scrappy girl detective precariously dangles over a lake with the high school goat mascot she just saved gnawing at the rope keeping them from hurtling into the water. It’s Nancy, so while all may appear lost, she will prevail and get her bad guy — in this case, the high school kid who ran off with the goat. But the opening is really just a reminder of Nancy’s resourcefulness before the real mystery kicks in. Since her inception, Nancy and her crew have ranged from paragons of pre-World War II gutsy female agency to more buttoned-down exemplars of the 1950s good girl, and then sadly reduced to Sweet Valley High-esque soapy characters in the late '80s and early '90s. But in 2018, with the country still reeling from the 2016 election and its backlash that, in part, inspired women to speak out against sexual harassment with #MeToo, to demand equal pay, and to run for elected office in record numbers, a Nancy Drew redux is prescient. St-Onge, who says she always tries to create strong representation with her female characters, agrees that it’s a good time for a new Nancy, something she says she’s thought she’d like to do for some time, especially in the world of comics. The new comic features Nancy teaming up with the Hardy Boys to help solve a mystery, but when Joe and Frank Hardy offer to climb into a cave first to help crack the case, Nancy insists it’s her mystery and she must go in first. “Our Nancy is certainly a feminist, and yes, Nancy has always been a feminist as far as I’m concerned,” Thompson says. But Nancy’s role in representing women’s equality isn’t the only aspect of their characters about which Thompson is resolute. Since she first hit the page in the early Nancy Drew Mysteries, the character of dauntless George, sporting a short haircut and a boy’s name, has always read as queer to her fans. But George is no single gay girl just helping her best friend solve crimes. 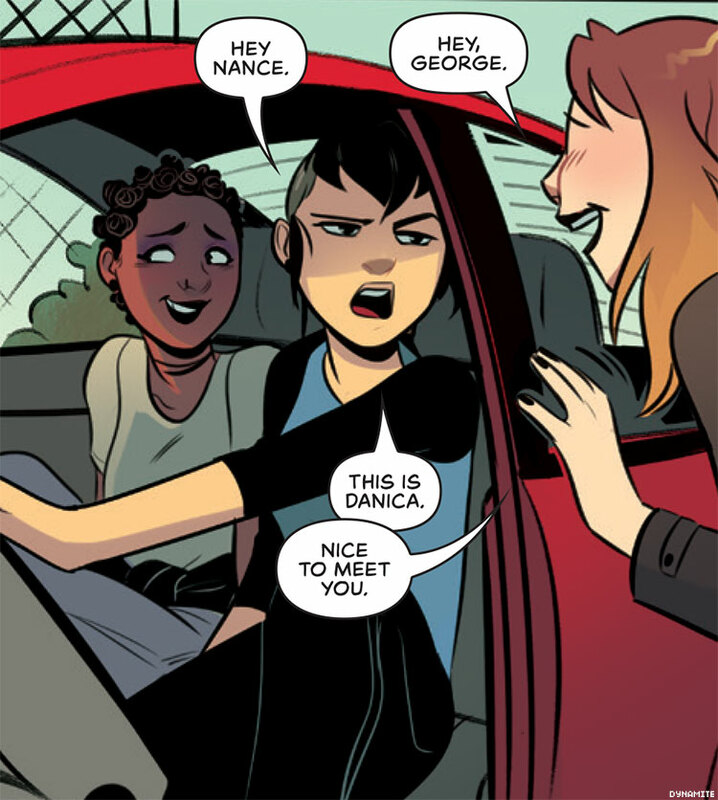 She’s an out character with a girlfriend, Danica (Dani), who also happens to be a queer woman of color. “I was determined to give her a girlfriend and put them on the page together romantically right out of the gate because I wanted it to be completely matter-of-fact. I didn’t want it to be left up to interpretation or to be hinted at and later revealed,” Thompson says. Like her drive to create strong women in her work, St-Onge also seeks to represent an array of people that reflect the world at large. Beyond Nancy’s feminist sensibilities, the introduction of queer women, and more people of color — this version of Bess is a person of color as is the new character of Pete — the new comic's thoroughly of-the-moment take on a classic universe features a narrative that touches on race and class, Thompson says. She adds that those issues are approached in an “organic and subtle” way. If Nancy Drew is a sign of the times, this Dynamite's Nancy is thoroughly of the moment and possibly as much of an inspiration to young girls as she was in 1932. "Our Nancy is all sass and brains and indomitable will. She's ultimately the hero that saves the day. And that’s important. I think she’s absolutely a hero for young girls to look up to, as Nancy has always been," Thompson says. "But she’s also got flaws that keep her human and relatable, which I think can be great for readers as well. Sometimes those flaws help us connect to and see ourselves in a character." 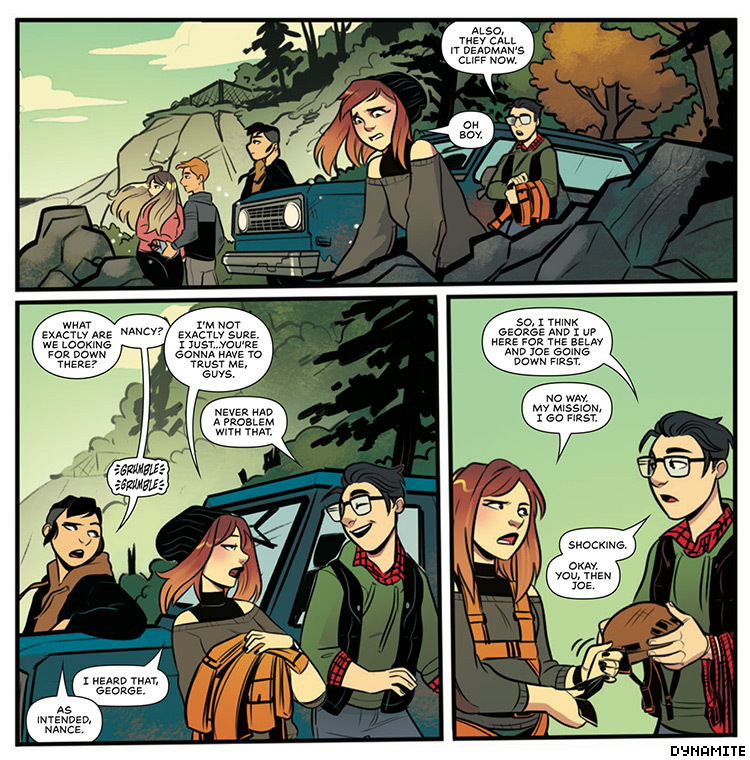 In addition to Thomspon, St-Onge, and Cosby, the team behind the New Nancy Drew Mystery Stories includes Triona Farrell (colorist), Ariana Maher (letterer) and cover artists Tula Lotay, Annie Wu, Babs Tarr, Jen Bartel, Paulina Ganuchea, Marguerite Sauvage, Emanuela Lupacchino.